Hi there, how are you doing? I hope you are enjoying your summer whether you are working or on vacation. Here in Europe we are suffering this amazing heat wave and I’m starting to crave a little cooler weather. Not cold weather, just a little less hot. Too hot makes knitting difficult (sweaty hands). I am not yet on vacation so I’m just knitting some around my work schedule and after work. 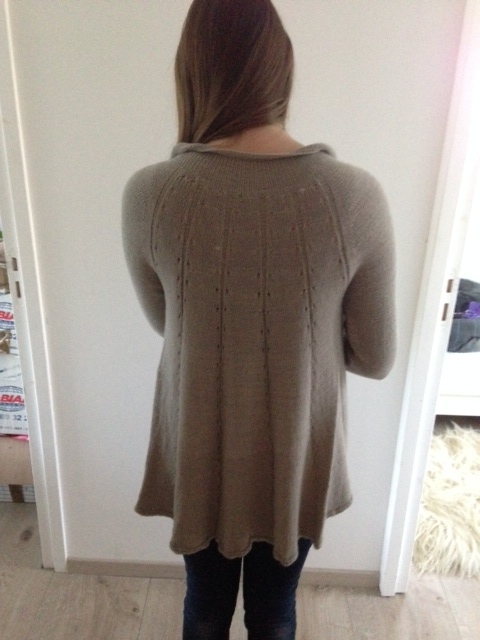 Since last week I have managed to finish two items that I would like to share with you. First there is my Main Street summer tee by Pip and Pin. This is now all done, washed and blocked. This was a fun pattern and I think I just might make a second one in a different yarn later. I might make the second version a little longer as the pattern calls for a somewhat cropped tee. 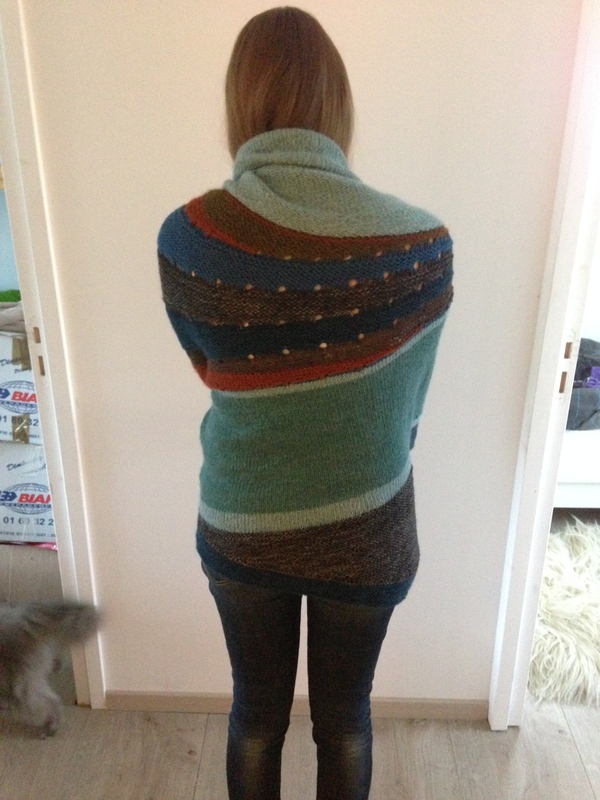 And as there are less than 30 projects for this pattern on Ravelry I entered mine into the Unsung Heros kal being held by Amber of the Yarn Hoarder podcast. I also managed to finish my first pair of Stitch Surfer Socks also part of a kal this time being run by Michelle and Leslie of the Knotty Knit Wits. This is a very fun sock pattern and it actually goes quickly. I was not able to mirror the socks as I wanted so I have now cast on for a second pair. I’m now knitting a smaller pair for my youngest daughter. I’m using the same solid yarn as in my pair and then a self striping yarn from Biscottes Yarn. This time around I’m hoping I will understand the instructions fully and be able to make the socks mirror each other. I also finished another pair of socks a while ago and just never got to show you a picture of the finished pair. I had knit sock one as part of a test knit and then had cast on for the second sock only to then set it aside in my mountain of wips. I finally picked it up again and finished the second sock and I’m so happy with the finished pair. The pattern is just amazing. It is called Narcissa Socks by Jo Ann Klim. The yarn is Hippo for Thanksgiving by Lolo Did It. I am still working on my Milu shawl. I’m now only 4 garter ridges from cast off so that should be done later this week. I really love the colors and yarns I chose for this project and I’m sure I will give this shawl lots of use come winter. This pictures gives you an idea of the color palette I chose even if it does not show the pattern well. It is all scrunched up on my needle. So this week I’m hoping to finish the shawl, make good progress on my second pair of Stitch Surfer socks and also work as much as I can on my secret sweater test knit. Even if the sweater test knit is in a DK weight it is taking it’s time to knit, I think because it is knit in pieces and my purling takes longer than knitting stockinette. I have until August 12 to finish and I’m almost at the shoulders on the back piece. Everything else is waiting to be knit so I have to hurry up some to meet the deadline. Thank you for stopping by again and spending time with me. Take care and happy knitting till next time. Hi there, at last (seems like I’ve been waiting for days) it’s almost WEEKEND! Hope you too are off from work and will be able to enjoy some downtime to relax and knit. I won’t have much downtime but I hope I’ll get some knitting done anyway. After that it was smooth sailing. If you are planning on knitting this sweater, I highly recommend the use of stitch markers for the lace yoke. I’d even go as far as to say that it is ESSENTIAL. I don’t know why I did not use them from the get go as I usually do! But hey, I got through it and now I only have the sleeves to do and the button bands for the yoke. Not the best picture but I was alone so I’m using the mirror. What do you think about the bright pink? So I cast off the body part of Snowflake Wednesday 16th of September and the same day I also cast off and even wove in the ends of my Drachenfels shawl by Melanie Berg! Talk about efficiency! 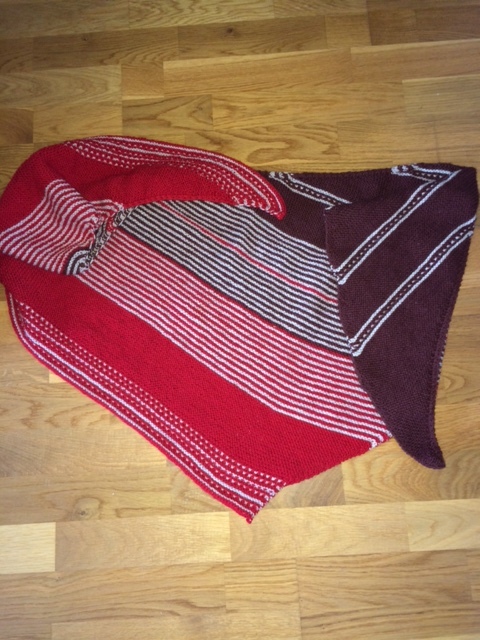 I’m very happy with the shawl and it is going to be a birthday gift for my mother. I really like the colors. I bought the pattern as a kit with the yarn on Craftsy. The yarn is from Brown Sheep Company. Also I played around with dyeing sock yarn. 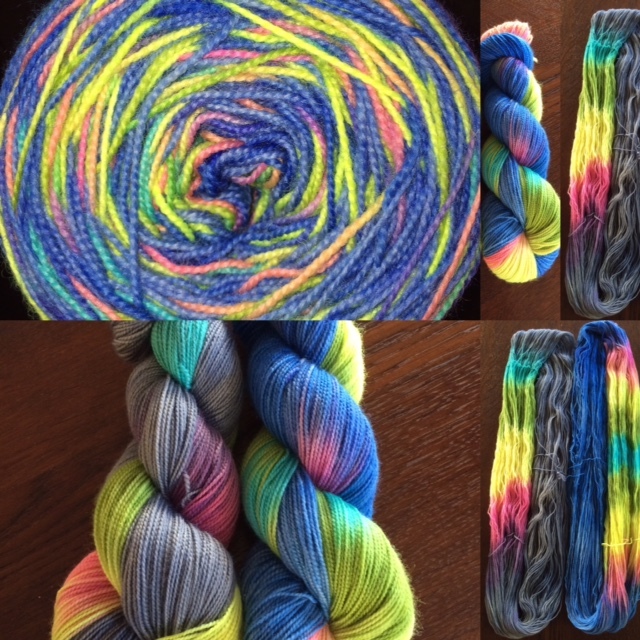 I dyed just 2 skeins as a test and shared on social media. The feedback was so good that I actually sold one of the two skeins! Which is great! So now I have one to test and I’m going to knit a pair of simple vanilla socks with that yarn. 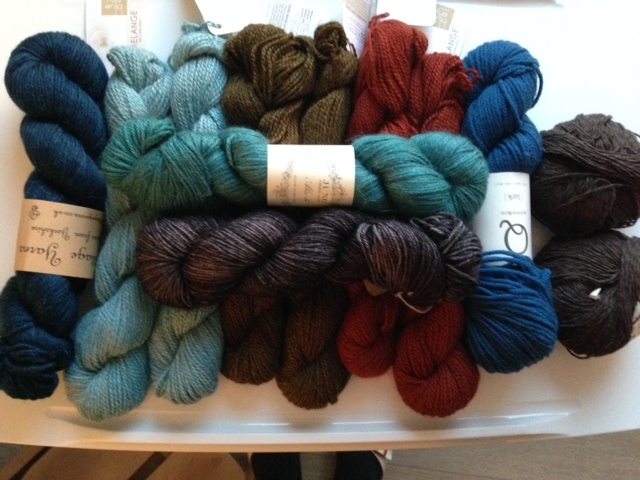 The yarn I sold is the grey one and I’ll be knitting with the blue one. That’s all for today. If you have finished anything lately you’d like to share with me, please do. I’d love to see what you’re working on. I think I’m ready for a SWEATER! Wow! That is an unusual statement coming from me! But I really think I am. It’s been a while since I last knit a sweater. 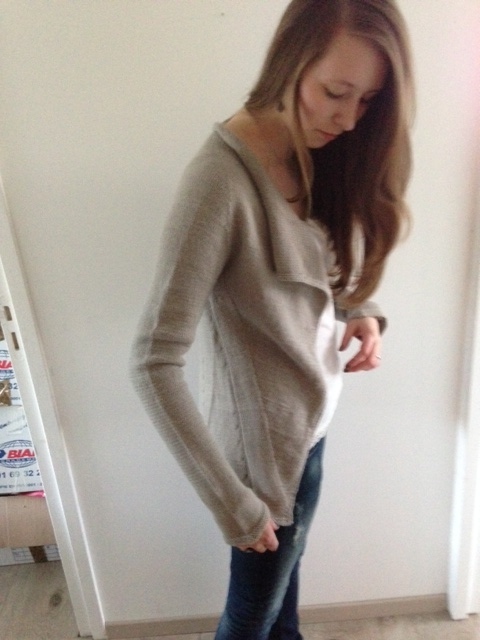 My last sweater was the Mesa by Stephen West. 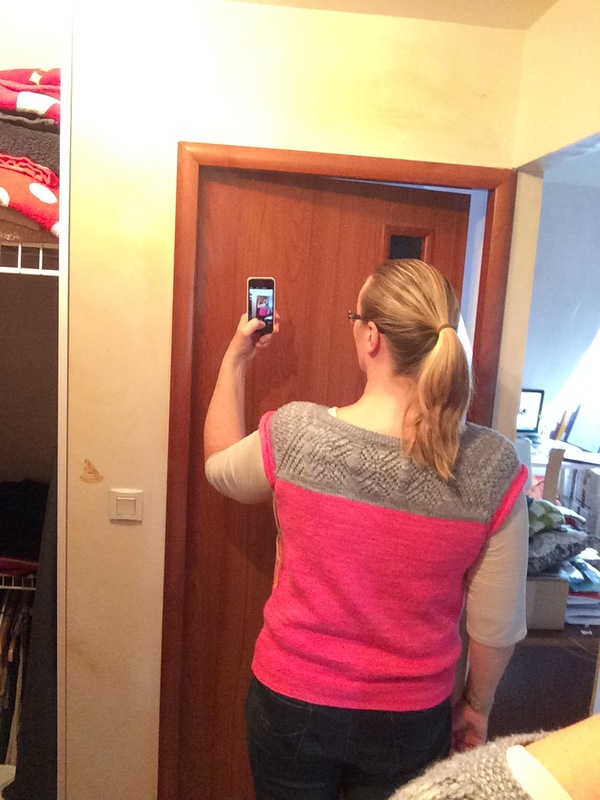 I had a bit of a sweater mojo in the winter 2013-2014 and actually knit 3 or 4 sweaters. Unfortunately I don’t remember which patterns I knit for the first 2 and I apologise for that but maybe the pictures will help you recognise the patterns. They all come from Ravelry and I believe all were paid for patterns. 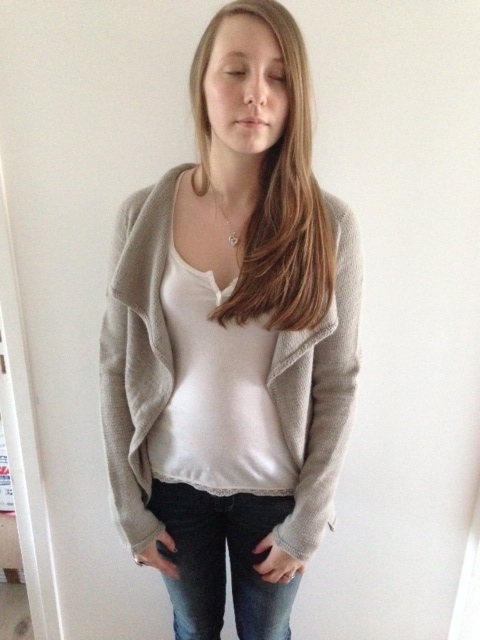 So here is the first one, all are modelled by my beautiful daughter Anais. And then I did the Mesa by Stephen West and I actually did 2 of those one for me and one for Anais. 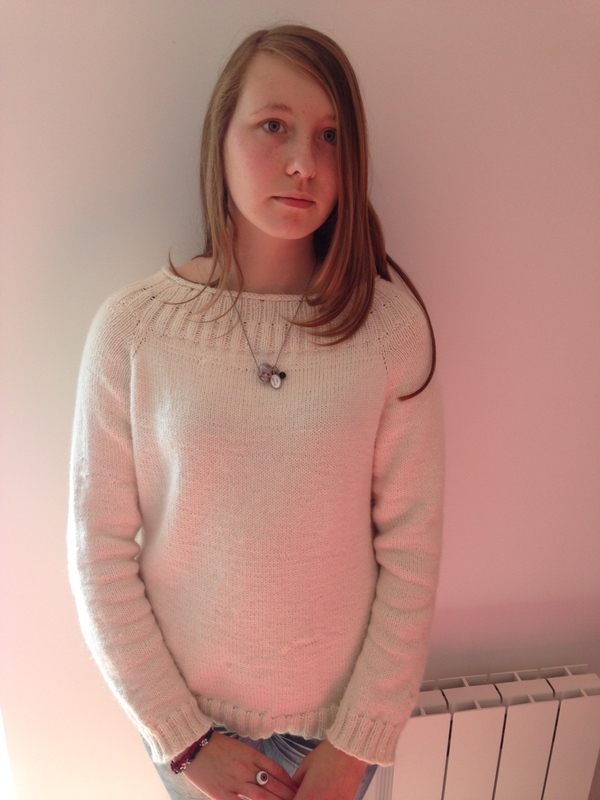 The above sweaters were both for Anais. 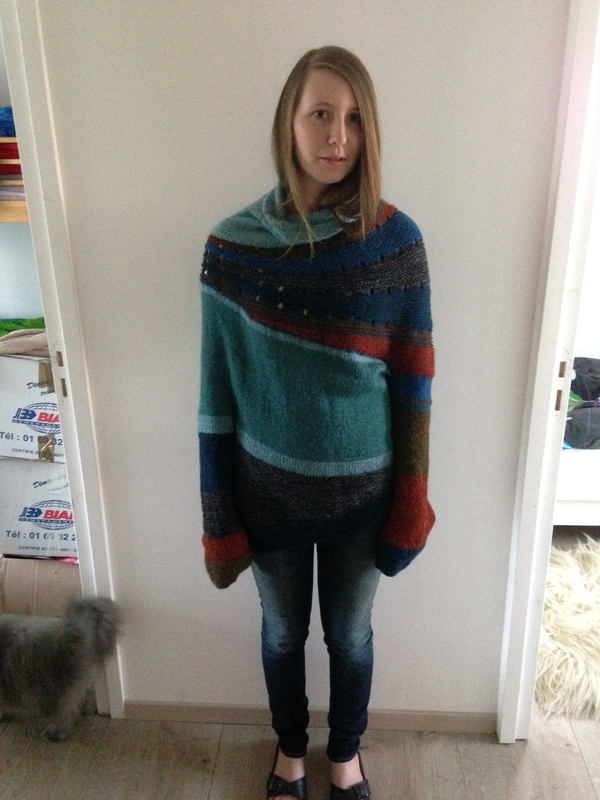 So the Mesa was a really quick knit and Anais liked mine so much that I went ahead and made a second one for her but as I’m writing this I can’t seem to find the pictures of her Mesa so I’ll have to share those with you later but here comes mine, modelled as before by Anais. First the yarns which are different types of yarns and from different yarn companies as well. Snowflake by Tin Can Knits This is a paid for pattern on Ravelry and I’ve seen lots of pictures of finished Snowflakes and they all look gorgeous. The only question I have is, should I make the button placket or not? I’ve seen both versions and both look good. Leaving the buttons out means knitting in the round from the beginning and that is appealing. Also, I don’t have any buttons in mind and this really does call for some nice and color coordinated buttons. So I need to think on that. Here is a link to the project page of one of my virtual knitter friends, LazyBene and I really love her version and colors of the Snowflake. If you are not familiar with this pattern, here’s a picture. 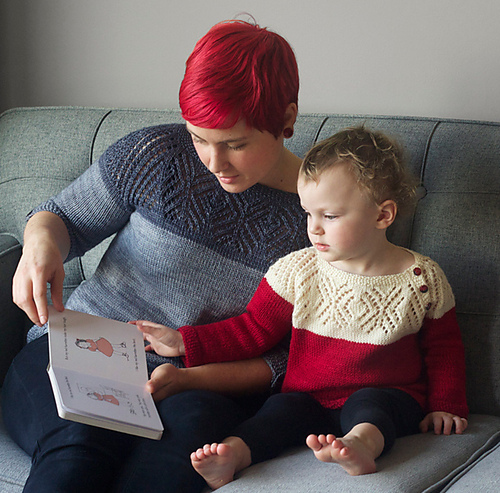 I love the fact that the pattern exists in a large number of sizes from 0-6 months up to 4XL so no matter what size you are looking to do, it’s there! 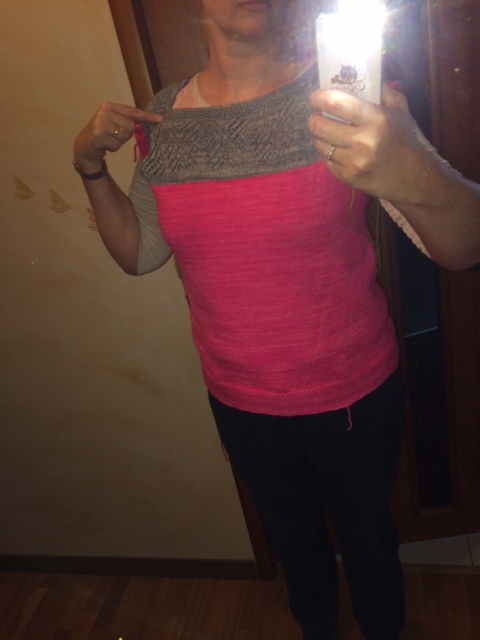 I also love the fact that you can do a 2 color knit. Of course you can do this in one color only but the 2 color version really looks good I think. And you can play with that idea and either do 2 tones of the same color or do 2 contrasting colors. This is knit in a DK yarn so I’m thinking maybe I’ll do my DK sparkling yarn for the yoke and then my Cash’merino DK for the rest of the body. Both are gorgeous and squishy yarns. Of course, I do NOT have any yarn in my stash so I’m going to dye some for this project. So I need to find some nice color combinations. I’m thinking maybe doing greys or grey with pink or grey with turquoise. Have you knit this pattern? Would you like to share a picture of your knit Snowflake and tell us about your experience knitting that? Or would you maybe like to knit along with me? Maybe we could do a KAL out of this and either use whatever yarns we like OR I could dye up some yarns for you – if you just give me your colors, that could be arrainged. What do you think? Well that’s all for today. Thank’s for stopping by:) I wish you all a wonderful weekend and look forward to hearing from those of you who wish to share something with me and my readers on this subject:) Take care and knit on!